This is a family recipe from Jan’s father. I do not know where the name comes from (Charlie Browns? ), but it is an excellent breakfast. It is, however, one that you generally have to plan ahead for. I supposed you could make this dish from scratch. Frying the potatoes and sausage fresh, but that would take away from the spirit of the dish. 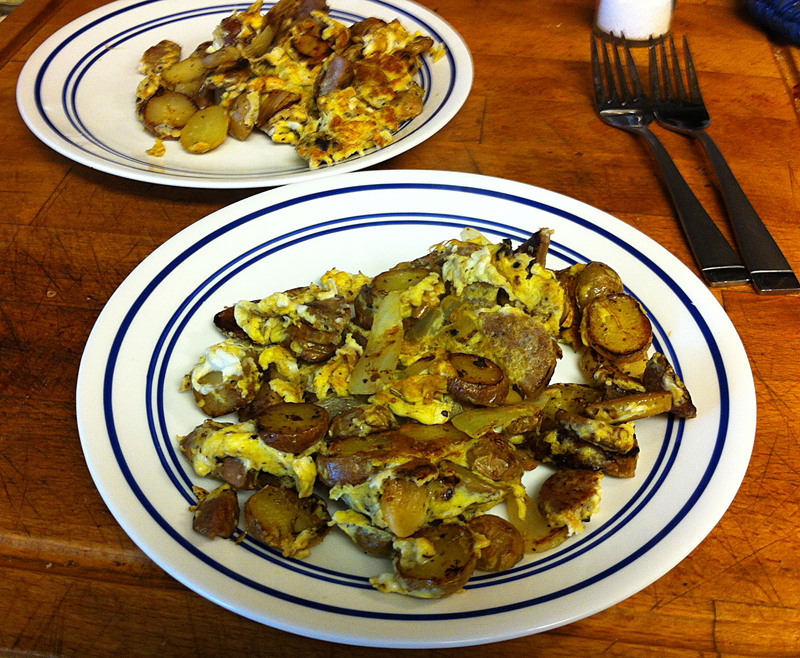 Using leftovers keeps the dish unique, because you are not always using the same kind of roasted potatoes and sausage. Quantities for this dish are vary variable. If you have lots of potatoes and sausage, you use less onions and eggs. If you have only a little bit of potatoes and sausage, you use more onions and eggs, and maybe some red or green bell peppers as well if you have them. This is a very flexible dish. How much of each ingredient you use depends entirely on how many leftovers you have and how many people are you trying to feed with them. Are you feeding a few people with lots of leftover potatoes and sausage or are you trying to feed a crowd? Note: This dish is not very Vegan friendly, but you could do it as a tempe and tofu scramble. Note: Jan just filled me in on the origin of Charlie B’s. Santa Barbara is famous for its breakfast places, but they go in and out of business on a regular basis. Our current favorite when we visit is Max’s. When she was going to graduate school at UCSB, before I met her, she was living in Isla Vista, a university village. Charlie B’s was the little cafe next to her apartment, run strangely enough by one Charlie B. where Jan ate breakfast frequently. When Jan went to Suriname, her parents stayed in her apartment and ate there as well. Her father was was the one to realize that they could make the These fried potatoes and sausages themselves, especially after Charlie B’s went out of business. We have been making them ever since, for the last 40 years now. 1. Cut the potatoes into 1/8 inch slices. If there is a lot of garlic and herbs clinging to the potatoes pull them to the side and reserve. Tip: If you like your potatoes chunky, rough chop them into half inch pieces. There is no set formula here, do what pleases you. 2. Cut the sausage and chop the onions into bite sized pieces and set aside. Tip: I like bratwurst in my Charlie B’s, but you can use any sausage that you have. If you do not have any leftover sausage, you can fry up some pork or chicken sausage and then cut it up. If you are an ovo vegetarian, I suppose you could even use tofu sausage. 3. Crack the eggs into a bowl and add the cream and salt. Lightly beat the eggs and reserve. Tip: There is a big debate apparently on whether to salt the eggs before or after cooking. ATC did their exhaustive testing and came down on salting before. The salt prevents the proteins in the eggs from binding together and gives you fluffier scrambled eggs, if you cook them at a low heat. 4. Heat a large sauté pan on high and fry the potatoes, without stirring, until golden brown on one side, about four minutes. Tip: You want a pan that is big enough not to be too crowded when you add the sausage and onions. If your roasted potatoes have plenty of olive oil on them you do not need to add any more to the pan. If your potatoes are dry, you may wish to add some extra oil or butter. 5. Flip your potatoes and add the sausage and onions (and bell peppers if you are using them). Continue frying until the onions are translucent, the sausage is heated through and the potatoes are brown on the second side. Tip: After you have cooked the mixture for three minutes you may want to start stir frying, so that the bits do not burn. 6. Add your pepper and any reserved herbs from the potatoes. Tip: If your roasted potatoes are already heavily peppered you may not need more. 7. Remove the pan from the heat and turn down the heat to medium low. 8. Pour in your egg mixture and gently fold the eggs and bits together until the eggs are fully cooked. Tip: If the heat of the pan is not enough to completely cook the eggs, move the pan back over the heat until they are done. 9. Serve with ketchup and hot sauce on the side.